The sound-set includes over 440 stunning samples of piano chord progressions. ThaLoops delivering the quality for the TOP piano riffs in RnB, Hip Hop, Pop, Dance and more. Over 440 one-shot wav samples of chopped piano chords & riffs designed for production of today's Hip Hop, RnB and Pop music. 182 megabytes in size, "Piano Shots 1" includes 15 automatically loading software sampler presets + soundfonts. The sound-set is organized and split into three tempos and keys. Tempo 100BPM contains 123 wav samples in G key, tempo 110BPM contains 160 wav samples in E key and tempo 120BPM - 148 samples in A# key. Each tempo is provided with 5 main themes + tons of professional chord progressions & variations. All tempo groups can be mix-matched across presets. 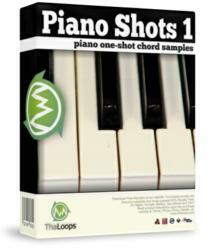 The "Piano Shots 1" Sound-set is packed with piano samples derived from ThaLoops "RnB Pianos 1" loop-set. The collection of one-shot piano samples makes creating chord progressions for the user a fun experience. With all packed dominants, subdominants, 7th, 9th chord inversions you get accompaniment for your melodies and hooks right away. Major & minor scales, professional dynamic piano performance layered with additional production sounds takes your songs to the Hit level. Strings, electric pianos, organs, rhodes were subtly added to color different piano instruments and themes. The chords will match any emotion: dark, melancholic, sad, light, happy or romantic. Each preset is programmed so that users can sequence song arrangements with ease.